Snowflakes found their way into the family room as well this year. 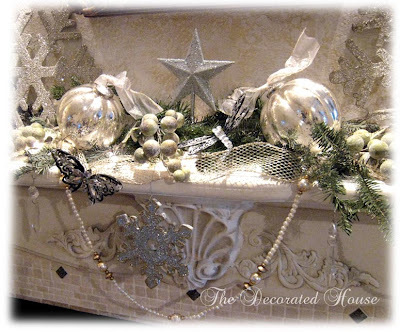 The mantel is dressed with more snowflakes and everything is silver and white with touches of gold and evergreens. I found the snowflakes at Target early in the season, and got them quickly before they were gone. They look better in the halogen light than in the living room's natural light where I used the snowflakes that I made from wood forms. Those were prettier in that light. I've been thinking of doing this room in more whites and neutrals so I wondered if I would miss color on the mantel this year. I'm not sure if I miss the color, but I do love the snowy, wintery feeling of it right now. It's cookie day at our house! We will be baking my favorite chocolate chip cookies and some white chocolate macadamia nut ones to take to my in-laws. That's if I can hide enough from Sweet Husband, because he loves those, too. I'm trying to take a few breaks now and then to go on the Home Tours, from both Tracey's site and BooMama's. What wonderful homes, people and decorations! It has been such a joy to visit each of you. And it makes me wonder, are you making cookies today, too? And are those little presents all wrapped? I'll be doing some of that the next day or so as well. Thank you to each of you for sharing your homes, and for taking the time to post a comment here. You are so appreciated! As usual, your decorations are just gorgeous! You have such a flair - it makes me a little jealous heehee!! Gifts are wrapped. Doing some cleaning today as we have friends coming Christmas Eve and family dinner will be here on Christmas Day. I did a big cookie day a couple of weeks back for a cookie exchange and to give to others, but I am making up cookie dough today for butter toffee cookies, thumbprints and the little wedding cookies. Will bake them tomorrow and have on hand for Christmas Eve and Christmas Day. I've so enjoyed your home and I think you need to do a home album for us. I just love your style. 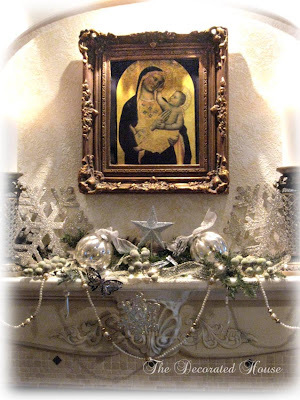 Donna, lovely photos as always...your madonna and child painting is just world-class fantastic! I managed to snag one of those huge snowflakes before they were all gone at Target! Everything looks so lovely - I hope you have a wonderful Christmas filled with peace and joy! Your mantle looks magically beautiful!!! Silver and white is romantic and fairytale-like too!! Hope you had fun making and eating those cookies. Your husband too!! Today is the day we celebrate with our family. I'm taking a coffee break, at the moment, to check on my friends. 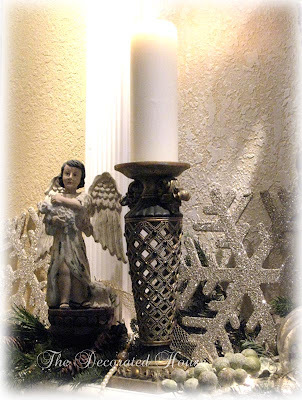 Your mantel display is amazingly beautiful! I've used my Donna Originals here and there around the house. They are wonderful! As I know you live in Florida (as I do), it's amazing the winter effect your mantel has.